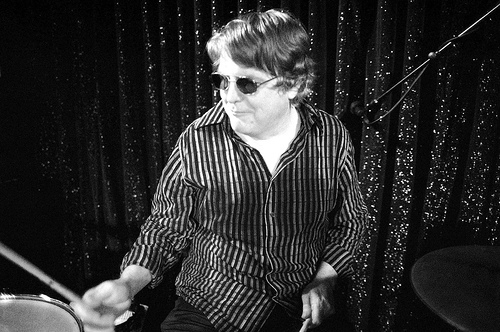 Drummer Mike Buck brings a wealth of Texas roots music experience to the table. He's been playing in Eve and the Exiles with vocalist / guitarist Eve Monsees since 2002 (their original bassist Speedy Sparks will also be with the band for their Stomp appearance). Mike has been a staple of the Austin scene since the mid-'70s, making his mark as a founding member of the Fabulous Thunderbirds and playing on their first two albums, Girls Go Wild and What's the Word. Buck split the T-Birds to form the LeRoi Brothers, and was also a member of Big Guitars From Texas. Eve and the Exiles made their first self-titled album in 2004 and encored four years later with Blow Your Mind. Married in 2010, Mike and Eve are also intimately involved in the retail end of the music business--they're two of the owners of Antone's Record Shop in Austin.